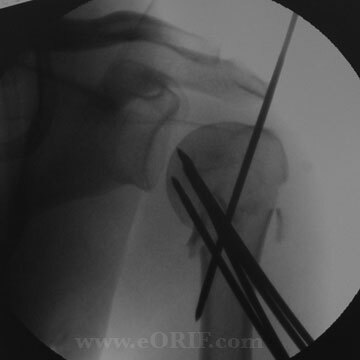 This protocol is for nondisplaced proximal humerus fractures, or patients stable fractures after surgical fixation. 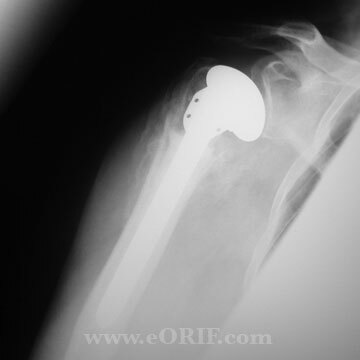 Goal: Maintain range of motion (ROM) without displacing the proximal humerus fracture. Due to variable stability of the fracture, check for specifications and precautions ordered by the orthopedist. Begin elbow, wrist and hand active ROM. A sling and swath, or Velpeau with and axillary pad should be used when not doing physical therapy. Begin pendulum exercises (clockwise and counterclockwise). After 7 days, begin supine ER with a cane. Fifteen to 20 degrees of abduction are permitted if the patient is more comfortable. Establish a home exercise program so patient is performing exercises 3-5 times per day for 30 min. each session. Begin assisted forward elevation (FE). Perform pulley exercises and teach for home program. Perform isometric exercises for IR, ER, extension, and abduction. Progressively increase patient’s position from supine to erect during FE exercises. Use therabands of progressive strengths for IR, ER, flexion, abduction, and extension. Goal is progressive strengthening of deltoid and rotator cuff. Begin flexibility and stretching exercises to progressively increase ROM in all directions. This protocol is for patients with unstable proximal humerus fractures. 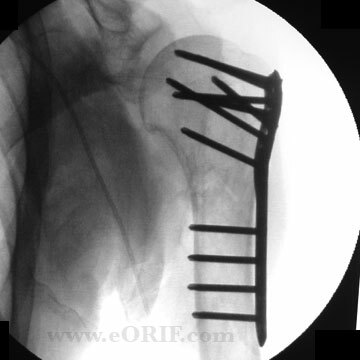 Goal: Maintain ROM without displacing the proximal humerus fracture. A sling and swath, or Velpeau with an axillary pad should be used when not doing physical therapy. After 14 days, begin pendulum exercises (clockwise and counterclockwise). Establish a home exercise program so patient is performing exercises 3-5 times per day for 10 minutes each session. Begin supine ER with a cane. Fifteen to 20 degrees of abduction are permitted if the patient is more comfortable. Begin active assisted forward elevation (FE). Begin supine active FE. Progressively increase patients position from supine to erect during FE exercises. Use Therabands of progressive strengths for IR, ER, anterior, middle and posterior deltoid. Begin flexibility and stretching exercises to progressively increase ROM in all positions (i.e. towel behind back, finger walking up the wall, etc. ).